Steven van Breemen - The "De Oude Klaren" and "De Goede Jaarling"
Home > The Development of my Strain > History > The "De Oude Klaren" and "De Goede Jaarling"
At this moment I find "De Oude Klaren '46" fully back in the racing and breeding results of my "Goede Jaarling". He is the son of "De Bels", the 4th National Ace Short Distance and "De 646 Duif (daughter of "De 411" which was 9th and 11th National Ace Short Distance when mated to his halfsister, also daughter of "De 08 Duif", namely "De 309"). "De Goede Jaarling" won several first prizes, under which just like "De Oude Klaren '46" the 1th prize National Chateauroux 650 kms (which is 200 kms flying distance more than "De Oude Klaren '46" had to fly) with headwind and flying 18 minutes ahead of nr. 2! Is that a coincidence?? 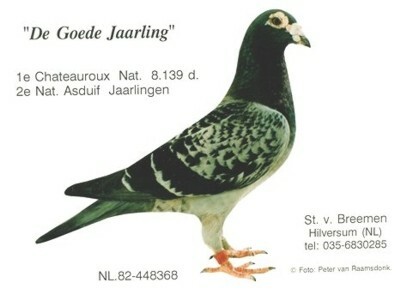 "De Goede Jaarling" base pigeon of the Steven van Breemen strain. His offspring wins 1st prizes in National competitions into 7 generations ! 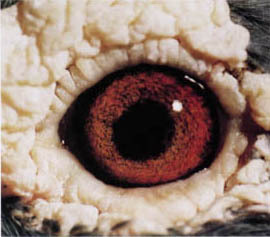 Everything you can dream of about eyes you find here! The youngsters of "De Goede Jaarling" are of a very high quality and with each hen he was mated to he delivered excellent youngsters. Most of his children went straight into the breeding loft because of their fabulous passing-on power of their gene material. May I say this when I state here that his straight family line produces National winners in 7 generations spread over the whole world?? With a difference of almost 40 years we find in the pedigree of "De Goede Jaarling" the very best bloodlines of the old De Smet-Matthijs strain: "De Schonen", "De Klaren II", "Het Kleintje" (daughter of the miracle breeding pair "De Schonen" x "De Angouleme duivin"), "De Groten", "De Dikke Blauwen", "De Sturen", "De Kapoen" and "Het Prinseske". All lines go directly and straight back on the most famous breeder that ever lived: "De Oude Klaren of '46"!! This is an example how I bred on with the De Smet-Matthijs pigeons and how successful I was on the races. I could describe lots of other birds of my loft in almost the same way!